This place is big. Really big. Covering 916 square miles Anza Borrego State Park is the largest state park in California and the second largest state park in the entire US. The park includes 12 wilderness areas, 500 miles of gravel roads and over 100 miles of designated trails. And at only two hours from the cities of San Diego and Riverside it’s easy to get to. Listen to the podcast with BCHA Jim McGarvey, Jaime Schmidt & Deb Caffin with USFS. Jaime is the National Program Manager for Trails and the one AERC signed the MOU with. Deb Caffin is the Recreation Program Manager for Trails Region 8. They talk about implementation of the National Forest System Trails Stewardship Act that was passed last year. In the last 18 months, long-simmering disputes have boiled over amid claims of trespassing, political meddling, government bullying, and retaliation. Some worry that what’s happening there may harbinger what’s to come on public land across the nation. It’s enough to call the situation, well, you know. In the fall of 2016, Rob Gregoire, a hunter and nearly life-long Montanan, won a state lottery for a permit to take a trophy elk in the Crazy Mountains, which rise from the plains about 60 miles north of Yellowstone National Park. Landowners around the mountains were charging about $2,000 for private hunts on their ranches. “That’s just not what I do, on principle,” Gregoire says. So he found a public access corridor that would take him into prime Crazies elk country—the federal land covered by the permit, which in total cost about $40. Such trails have led into the Crazies for generations. And disputes between landowners and those who would cross their properties on these trails reach back nearly that far, too. By 2016, the trailhead Gregoire found was “the last non-contested public access point on the 35-mile-long eastern flank of the Crazy Mountains,” he would write later to his U.S. senators. It would seem Republicans and Democrats are wholly divided on public land policy. During the 2016 campaign, the GOP platform called on Congress to “immediately pass universal legislation” to “convey certain federally controlled public lands to states,” while Democrats sought “policies and investments that will keep America’s public lands public” by prioritizing access and environmental safeguards. But, believe it or not, some consensus exists. A pair of bills introduced this year—including one that would make it easier to transfer federal land to states—shows that Republicans and Democrats can actually agree on certain aspects of public land management. In January 2015, the Pacific Crest Trail Association received a letter from the owner of a 402-acre plot of land near Stevens Pass, roughly 75 miles east of Seattle. The landowner, a family trust, held one of the few remaining privately held patches of the Pacific Crest Trail—a parcel that thousands of Washingtonians use each year to reach alpine wilderness areas and thru-hikers traverse on their way up to the northern terminus at Manning Park. The family trust, the letter said, wanted to sell. It was good news for the PCTA, a nonprofit that’s been laboring to preserve and protect the 10 percent of the long-distance trail that, surprisingly, still sits in private hands. But the landowner, who remains anonymous, wanted to play hardball. The trust had divvied up the plot, which lies near the popular Stevens Pass ski area, into 16 different parcels, and according to a memo put together by the trust’s real estate adviser, the zoning meant a prospective buyer could build up to 748 dwellings in the pristine Cascade wilderness along the trail. Even more worrying, the letter made clear that the trust was willing to erect a fence across the section of the PCT that crossed its property, bisecting the trail 150 miles short of the border. “For us, not only was it a big threat they could close the trail,” says Megan Wargo, director of land protection at the PCTA, “but we had done some fieldwork to look at what it would take to reroute the trail. It wasn’t just a simple loop around; it would have taken an extensive reroute to get around some serious topography. It would have had a significant impact on people’s ability to do a thru-hike.” Wargo estimates it would have taken a year to reroute the trail. From Arizona to Oregon, states have different tactics to make money off their state trust lands. The Dolores Ranger District is accepting public comments on a preliminary environmental assessment for the Boggy Draw Trails expansion project. The project would add about 25 miles of nonmotorized trails to the trails system, north of Dolores. The area currently includes 20 miles of motorized trails and 35 miles of nonmotorized trails. American Trails exists to help the trails community to communicate, share information, and work together to build the strength of our message that trails move the world. Toward that end, American Trails introduces an ongoing series called “Breaking Down the Silos,” where we discuss the happenings and ideas that help to bridge the barriers between the different trail user groups and bring all members of our trails community together to ensure positive change in our trail world. Mike Passo, American Trails’ executive director, recently attended the National Off-Highway Vehicle Conservation Council (NOHVCC) Conference in Manchester, NH. Paradise. For some that’s an image of a tropical beach, for me, it’s a dirt trail that twists and meanders to a backcountry camp deep in the wilderness. It’s a quiet solitude punctuated by the peaceful clip clop of hooves and the far scream of an eagle aloft. It’s the sweet perfume of pine on a warm summer day. It’s the companionship of a trusted horse who will faithfully take you home. Unfortunately, in a growing number of cases paradise is padlocked. In only a few short generations we’ve “improved” a lot of backcountry and rural areas into suburbia and shopping malls. Trail Closed signs are both dreaded and unfortunately frequently encountered. Least we lose them, we’d better take care of the equine friendly country that remains. Paradise needs protecting. You don’t have to be a trail rider, or even have your own horse, to recognize the importance of conserving horse trails. There are many things that each of us can do to preserve equine trails. Here’s one easy thing that you and I can do to help keep our trails open. I count this under the headings of both good stewardship and good relations with other trail users. Rain will be in the forecast. Throughout the spring season, trails tend to be more saturated and hold more water, sometimes taking days to dry. Simply put, if mud or wet trail is sticking to your shoe or your horse’s shoes, you should turn around. I understand that “stuff” happens. Through either bad circumstance or poor judgment, we’ve all found ourselves in situations and on trails we shouldn’t have been on. I‘m not here to place blame, or be a trail Nazis, but simply to spread awareness and encourage everyone to be considerate trail users. After all, these are our trails, paid for largely by our tax dollars, donations, and volunteer labor. It’s up to us to protect and sustain them for years to come. Six years ago, my friend Lori Johnson and I were riding our horses on public land near my home on a perfect Saturday in June. After saddling our horses, we led them toward a gate and experienced our first interaction of the day: a mountain biker who was getting ready to go on a ride with his children. The biker was rather abrasive and complained about equestrians damaging trails when they are wet, expecting bikers to stop and get off the trail, and generally causing aggravation. Lori and I were nice to them, our horses were well behaved, and I left with a comment about all of us getting along and getting to know each other better. Our second and third interactions with bikers on “our trails” were equally negative. The following weekend I talked with my son, who is a mountain biker, about the possibility of changing attitudes and learning more about each other. And I hatched a plan. The following month a mountain bike race was scheduled near Sturgis, SD, near my home. With a copy of the ride map, my horse Hawk and I were ready at mile 20 to get behind the last rider and “sweep.” I picked up GU containers, lost water bottles, and a few parts lying along the trail. Ten miles later, I found an injured woman in an area with no cell phone service. After making sure she was okay, I helped her mount Hawk and pushed and rode her bike down the trail until she could call her family. I took her to a place they could pick her up along with her bike. I continued on and at the finish line received a substantial standing ovation... and many thanks for the trash and parts I’d picked up along the trail. SANTA FE, N.M. — It’s been a long time coming and will take a few more years. But public access to some of the most scenic, historic and culturally significant acreage in Santa Fe County is on the way now that the County Commission approved the master plan for Thornton Ranch Open Space. The action paves the way for an expanded trail system that can be used by hikers, mountain bikers and horseback riders, and an educational hub augmented by interpretive signs to introduce visitors to the site. Public access could come as soon as 2021. The master plan, as well as a management plan for the space, was approved by the County Commission earlier this month, along with management plans for Petroglyph Hill and the Galisteo Basin Interpretive Plan. While increasing access is part of the plan, “first and foremost, it’s for the protection of cultural resources – then to provide meaningful public access,” she said. Santa Fe County has finalized a long-awaited plan to open up almost 2,500 picturesque acres in the heart of the Galisteo Basin. Hikers, bikers, outdoor explorers and horseback riders will soon be able to enjoy the Thornton Ranch Open Space. New trails will be built, and much of the “culturally sensitive” land and archaeological resources in the scenic conservation area 15 miles southeast of Santa Fe are to be improved or restored. The Thornton Ranch master plan was approved last week to applause by county commissioners. They also authorized an interpretive plan for the Galisteo Basin and a management plan for Petroglyph Hill, a small volcanic summit that is sacred to Native tribes and was designated for protection by Congress in 2004. These documents will together guide the public use and management of what is the county’s largest open space, with 360-degree mountain views and immaculate night skies. The GOP doesn't think the feds should oversee our national heritage. Here's why they're wrong. States should manage the public lands within their own borders, right? It sounds like one of those common sense, local management, small government things that will be in the citizens’ best interests. It’s actually exactly the opposite. That's because the federal government is mandated to manage public lands for multiple uses. So for-profit enterprises, like logging and drilling, need to co-exist with folks who want to hike, bike, and play on those lands, as well as the wildlife that already lives there. In contrast, states are mandated to manage their lands for profit, which means logging and drilling take precedent over public access and environmental concerns. November is one of my favorite month’s of autumn when the horse riding and camping trips can vary between encounters Indian Summer’s warm breezes and glorious golden leaves to bitterly cold sheets of driving rain that drives us indoors to the welcome warmth of a fire. It’s a month of change as we move into winter. The fight over preserving public land during the Trump era is taking a strange, angry twist in Montana’s Crazy Mountains. Both sides are armed. Brad Wilson is following a forest trail and scanning the dusky spaces between the fir trees for signs of movement. The black handle of a .44 Magnum juts prominently from his pack. If he stumbles on a startled bear at close range, the retired sheriff’s deputy wants to know the gun is within quick reach, in case something stronger than pepper spray is needed. Wilson isn’t the type who likes to take chances; he’s the type who plans ahead. Before setting foot on this path, he unfolded a huge U.S. Forest Service map and reviewed the route, Trail 267. He put a finger at the trailhead, which was next to a ranger’s station, then traced its meandering path into the Crazy Mountains, a chain in south-central Montana that’s part of the northern Rockies. Like many of the trails and roads that lead into U.S. Forest Service land, Trail 267 twists in and out of private properties. These sorts of paths have been used as access points for decades, but “No Trespassing” signs are popping up on them with increasing frequency, along with visitors’ logs in which hikers, hunters, and Forest Service workers are instructed to sign their names, tacitly acknowledging that the trail is private and that permission for its use was granted at the private landowners’ discretion. What appears to be a longstanding, bitter feud between two different user groups of the Dufferin County Forest reared its head last Thursday as County Council heard from horseback riders who feel hard done by recent changes to the recreational policy for the site. It was a busy night inside council chambers as people on both sides of the issue filled the gallery, with the horse riders especially vocal as they sought to change a new policy, implemented in May, that the County spent the best part of four years putting together. In that policy, Council agreed to dedicate a 26-kilometre loop of the Main Tract in the Dufferin County Forest to mountain bikers only, much to the chagrin of the local horseback riding community. Eight delegates spoke at the meeting on Thursday, each presenting different thoughts, opinions and points on the new policy. companionship of a trusted horse who will faithfully take you home. Unfortunately, in a growing number of cases paradise has padlocks. You don’t have to be a trail rider, or even have your own horse, to recognize the importance of conserving horse trails. There are many things that each of us can do to preserve equine trails. Unfortunately, often it’s sometimes hard to explain why groups like ours are important. Here are some of the reasons to join that I talk about during my expo clinics. Horse clubs are focal points for both social events and trail stewardship efforts. For me the biggest reason to join an equestrian club is for the comradery of people who have the same interests. Being able to talk about trail conditions, feed, training, etc. is priceless. Don’t have a local Back Country Horsemen group nearby, or don’t care for the one that is? Start a new one. These organizations are always looking for new members and new chapters. A quick google search will put you in touch with someone who can help. This webinar will cover some basic insights on how sustainable and long lasting trails should be created. The discussion will start with proper design techniques, where the trail should go, where shouldn't it go, and why. This will be followed by a talk about best management practices for construction that will create durable trails in many different terrain and soil types. From its inception over 40 years ago, Back Country Horsemen of America established a solid reputation as a service organization. Its members are known as hard-working, knowledgeable folks who turn up when there’s a job to be done. Some people wonder why. Why would they spend their free time, weekends, and vacations from their jobs bending their backs, growing blisters, and braving the weather time and time again? The answer is simple, really. They love the land. They cherish the untouched and scenic landscapes all around us that cannot be accessed by RV or four-wheel drive SUV. They treasure those carefree days when they traverse those lands in what seems like the most natural way: on the back of a horse, like our ancestors who first explored these areas. Back Country Horsemen of America was created because people like this saw the break-neck speed of development and knew if they didn’t take action, future generations wouldn’t have places like these to marvel at. They work so hard to keep trails open because someone has to, or those recreation opportunities will be dug up, paved over, or cemented under. The Big South Fork Chapter of Back Country Horsemen of Tennessee greatly values the natural wonder for which their group is named: the Big South Fork of the Cumberland River, the main feature of the remote Cumberland Plateau. North White Oak Creek, a major tributary that runs all the way to Jamestown, and its accompanying O&W Trail (an abandoned railroad right-of-way) provides many miles of picturesque recreation opportunities for equestrians, hikers, and bicyclists. But each spring, the Creek becomes a raging whitewater, cutting new paths and destroying crossings constructed for use in quieter times of the year. A joint venture between BSFBCH and the Big South Fork National River and Recreation Area (BSFNRRA) set out to replace the natural crossing (treacherous basketball-sized rocks) with a hard surface that would also protect the stream banks at the Zenith Day Use Area. Since this is one of the few developed places inside the legislatively protected gorge area of the park, this seemed like a sound compromise between recreation and preservation. Back Country Horsemen volunteers purchased the necessary materials, built the structure off-site to federal environmental standards, accomplished the monumental task of transporting the 16 two-ton concrete slabs into the creek gorge, and installed them from bank-to-bank across North White Oak Creek. This project was funded through numerous BSF Back Country Horsemen events, including trail rides, campouts, raffles, and auctions, and from their own pockets. BSFNRRA restored the Zenith Day Use Area through a National Park Service Centennial Challenge Grant, a federal fund-matching program. Big South Fork National River and Recreation Area encompasses 125,000 acres of the Cumberland Plateau in Kentucky and Tennessee, where the free-flowing Big South Fork of the Cumberland River meanders and rushes between magnificent bluffs, high arches, and other amazing natural formations. Nearly 200 miles of horse trails, many commercial camps and resorts, and three National Park Service camps provide equestrian visitors with a back country adventure unique in the eastern United States. When you visit, you’ll see the hard work of Back Country Horsemen all around you – passable trails, safe water crossings, maintained trailheads, and America’s awe-inspiring landscape unspoiled for your enjoyment. If you want to know more about Back Country Horsemen of America or become a member, visit their website: www.bcha.org; call 888-893-5161; or write 59 Rainbow Road, East Granby, CT 06026. The future of horse use on public lands is in our hands! Equestrian Voices Needed: Attend the Oregon Trail Summit! OREGON TRAILS SUMMIT REGISTRATION IS OPEN! Who should come to the Oregon Trails Summit? The Oregon Statewide Trails Coalition is being planned by a committee of public agency, non-profit, and private sector trails enthusiasts. Sponsorship opportunities are available! Contact Steph at noll.stephanie@gmail.com for more info. Northern Kettle Moraine Horse Trail Association completed trail enhancements totaling $32,000 on chronically wet Kettle Moraine State Forest - North equine trail. The Horse Trail Association values Wisconsin’s state forests and works hard to protect our right to enjoy these lands by horseback, according to a press release. The House Appropriations Committee is recommending appropriating $275 million from the Land and Water Conservation Fund (LWCF) to be used for acquiring land for conservation and recreation for Fiscal Year 2018. This is $125 million less than Congress appropriated for Fiscal Year 2017. During the Committee’s markup of the 2018 Bill, Appropriations Committee Chairman Rodney Frelinghuysen and Interior Subcommittee Chairman Ken Calvert both stated that they are willing to seek greater funding for LWCF in deliberations with the Senate later in the appropriations process. The House and Senate are expected to work toward passing the 2018 Appropriations bills in September after Labor Day. If Congress appropriates $400 million for LWCF projects as it did for Fiscal Year 2017 then projects along the Continental Divide NST and Overmountain Victory NHT could be funded. Even today, over 40 years after its creation, Back Country Horsemen of America still adheres to the principles that guided its founders: keeping trails open for equestrians requires 1) a desire to keep trails open for all and 2) making yourself part of the solution with boots-on-the-ground trail work and generous distribution of responsible recreation skills through clinics and one-on-one instruction. The Buffalo River Chapter in Arkansas applies BCHA’s vision and mission to the wild lands in their state with determination, drive, and heart. The Buffalo River Chapter BCH’s primary focus is the Buffalo National River and its watershed in northwest Arkansas. This National Park Service gem stretches 136 miles from Route 21, through five counties, to Route 14 and a Wilderness area also maintained by the NPS. Within and adjacent to the National River are Wilderness areas managed by the NPS and the US Forest Service, Ozark National Forest land, Wildlife Management Areas, and other conservation land. Buffalo River Back Country Horsemen cherish this, America’s first National River. It flows freely nearly 150 miles from headwaters high in the Boston Mountains of Ozark National Forest to White River near Buffalo City. This national treasure encompasses almost 96,000 acres of rugged mountain terrain that is best accessed by horseback, massive limestone bluffs, deep hollows, and lush valleys. BRBCH knows the 75 miles of equestrian trails very well. They ensure that they are clearly marked with yellow blazes, whether they are old road traces, gravel bars, or rocky mountain paths. These Back Country Horsemen remove downed trees, clear windfall, and repair water crossings on the trails that meander gently, crisscrossing the river many times. On the narrow, steep, and challenging trails, they repair washouts, dig out rocks in the trail tread, and lay down durable surfaces where needed. Buffalo River Back Country Horsemen also maintain horse campsites, like the primitive camps at Steel Creek and Erbie, where recreationists find basic facilities like a pit toilet, fire grates, and places to hightie their horses. On the middle Buffalo, equestrians can stay at Woolum horse camp, which also has ample trailer parking. Wagon Gap and Hathaway camps on the lower Buffalo have no water and no facilities, but they access beautiful trails along the river. Back Country Horsemen of the Buffalo River Chapter have spent many happy hours on horseback, both clearing and enjoying trails not only in the Buffalo National River, but also through the rest of their state’s stunning and varied landscapes. They help maintain trails in Wildlife Management Areas overseen by the Arkansas Game and Fish Commission, including the Gene Rush and the McElroy Madison County Wildlife Areas. The Buffalo River Chapter works and coordinates with the Buffalo River National Park through a special Memorandum of Understanding that outlines their working relationship with the Park. Through regularly scheduled work days, the chapter puts their mission into action. They keep trails open to everyone by clearing brush and deadfall, pruning low-hanging branches, picking up trash, placing water bars to control erosion, and maintaining horse camps. Their skills are especially valued when work is required in Wilderness areas too fragile for mechanized travel and power equipment. Their steady horses and mules haul equipment and supplies necessary for repairs, and the hard-working BRBCH members use hand saws, nippers, and loppers instead of chainsaws. In 2015 alone, BRBCH contributed over 3072 volunteer hours to the Buffalo National River and its surrounding areas. Members also volunteered their time in the Ouachita Mountains, the Ozark National Forest, six different Wilderness Areas, and several Wildlife Management Areas maintained by Arkansas Game and Fish, totaling more than 1845 hours of trail work that year. In keeping with their mission to educate others on the wise use of our limited back country resource, Buffalo River Back Country Horsemen provide classes in CPR and first aid, packing with stock, and Leave No Trace Outdoor Ethics principles. They also host an annual Youth Camp Weekend that promotes responsible riding, packing, and camping skills to young people in a fun, safe environment. Chapter members experienced with Leave No Trace, back country packing, and other skills regularly share their knowledge with other members and the general public. Several members are trained and participate in Wilderness Search and Rescue, providing a life-saving resource to the public. One spring, the National Park Service had cut some logs to be used to repair a badly washed out stretch of trail leading to the Hathaway Horse Camp in the Lower Buffalo River Wilderness. Five members of the Buffalo River BCH and their horses joined three NPS trail personnel in moving the logs to the repair location. This area of the Ozark Mountains is a rough and rugged place to ride, but the washed-out trail was so hazardous that even experienced BCHers led instead of rode their sure-footed horses up the hill. They used horses and mules to drag thirty-five 8-foot cedar logs a quarter mile from the adjacent wooded area to the damaged trail so the repair could be made, all without the harm caused by motorized vehicles and equipment. If you want to know more about Back Country Horsemen of America or become a member, visit their website: www.bcha.org; call 888-893-5161; or write 342 North Main Street, West Hartford, CT 06117. The future of horse use on public lands is in our hands! In the upstate areas of the New York City watershed, equestrians are losing access to trails on land newly acquired by the water authority. Often, the trail segments lost to use provide connections that can’t be replicated by detours as they cross long stretches of land. The New York State Horse Council is taking steps to understand why these trails have been closed to horses, and what they can do to regain access. Publicly owned open space, lengthy trail corridors and a variety of landscapes create the backbone of our riding and driving needs. Managing public agencies range from municipal parks and woodlands, to state parks and natural resource areas, to federal parks and the vast natural resource zones. Ownership and management of these lands may also be jointly undertaken between multiple agencies. If you are riding on public land, you should know not only the government agency or agencies involved, but their rules and regulations, their planning and decision-making processes and schedules, and the specific land managers for your region. The Forever Wild Wehle Tract consists of 1,500 acres of rolling hill country through open pine grasslands and mature hardwood bottomlands. The Forever Wild Wehle Tract consists of 1,500 acres of rolling hill country in Bullock and Barbour County, AL. The tract was once owned by Mr. Robert Wehle whose dream was to see that the property be protected by the Alabama Forever Wild Program and that the land be used for educating people about Alabama's need for conservation. The Wehles generously funded the construction of the ROBERT G. WEHLE NATURE CENTER on land they deeded to the State Lands Division. This center was opened to the public for use for education and enjoyment. There are three trails, which are part of the Forever Wild Wehle Trail System, that extend away from the Center, taking hikers on short, medium, and long treks through different habitats. These trails are augmented with interpretive stations highlighting the unique characteristics of many local plants and animals. The Nature Center can also be reserved for meetings, school field trips, and approved special events by appointment through the State Lands Division. Hikes are better with friends, and some trailblazers say man’s best friend is the perfect companion, especially if your four-legged companion happens to be of the equine variety. If you fall into this category or have been looking for a good place to start a trail riding tradition, there are plenty of places near and far that can have you saddled up and ready to ride in no time. Sunset Chevrolet LogoEZ Times Trail Rides in Elbe, Washington, has been serving the South Sound for nearly 30 years. Owner Jeff Celskki cleared and shaped all of the trails around his Elbe ranch when he moved to the area in 1989, and the routes he created take riders past points of interest like Lake Adler, the Nisqually River and several overlooks that offer views of the Elbe Hills. Rates vary per trail and number of riders, but rest assured that horses here hit the trail rain or shine, sleet or snow. You can learn more about taking in a one-, two- or three-hour guided ride, designed for equestrians of all ages and experience levels, on EZ Times Trail Ride’s website. Kiddos are welcome! Southern Kettle Moraine Horse Trails Association (SKMHTA) is once again preparing for its annual fall roundup, scheduled this year for Saturday, Sept. 9. The event needs volunteers, donations for raffle baskets and silent auction items, as well as sponsors and cash donations to make this eighth annual fundraising event successful. Proceeds are used to maintain and improve the horse trails and campground in the Southern Kettle Moraine Forest. A public discussion about a network of trails around the North Mesa Stables took a sharp turn Wednesday when county officials gave an update on a proposed “flow” trail meant exclusively for mountain bikers. After County Parks and Recreation officials gave a brief update about the proposed flow trail, residents who attended the meeting debated whether the trail was a good idea at all. 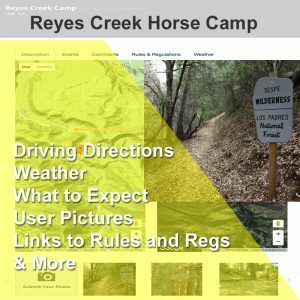 According to county officials, the trail, if built, would parallel and intersect an existing popular horseback riding and hiking trail in Bayo Canyon. A proponent and founder of the flow trail idea said it couldn’t go on Pajarito Mountain because the ski area is privately owned. Lisa Reader, an avid horseback rider and leader in the local riding community, thought the flow trail needs to be somewhere else too, that horse owners are slowly getting squeezed out of the recreational trail picture. On July 26, Sen. Ron Wyden (D-OR) and Rep. Rob Bishop (R-UT) introduced the “Recreation Not Red-Tape Act (RNR)” (S. 1633, H.R. 3400), legislation that expands the scope of the National Forest System Trails Stewardship Act (PL 114-245), signed into law in late 2016. While the RNR focuses on streamlined permitting to access public lands, the bill includes provisions that would authorize the Department of the Interior, through the Bureau of Land Management (BLM), to enter into cooperative agreements with private parties to promote the role of volunteers in trail maintenance. The bill also authorizes the Department of Agriculture (USDA) and BLM to develop an interagency trail management plan that will assure uniform maintenance standards for trails crossing jurisdictional lines between the two agencies. The Trails Act outlines a detailed program including goals and timetables by which the USDA will leverage private partners to clear trails long overdue for maintenance. Unlike the RNR Act, which applies to both the BLM and USDA’s National Forest System (NFS), the Trails Act focuses only on trails under the jurisdiction of the NFS. Chairman Bishop and Sen. Wyden worked closely on the bill to emphasize key issues – especially outdoor recreation permit streamlining – that will likely attract bipartisan support. GOP staff with the House Natural Resources Committee, which is the committee of jurisdiction for federal land issues, are encouraging AHC and allies to help drive cosponsors for the legislation, which currently has none. Committee staff also state that the Subcommittee on Federal Lands will conduct a markup in late September or October, giving members the opportunity to offer technical corrections and amendments to the text. To review a summary of the legislation, please see the following link: https://www.wyden.senate.gov/download/?id=DDF411A6-5D21-40BD-B17C-2BF73A2B9C51&download=1. If you would like more information about the RNR Act and related lobbying activity, please contact Bryan Brendle at bbrendle@horsecouncil.org or 202-296-4031. ELCR, in partnership with the United States Dressage Federation (USDF), is pleased to announce the inaugural Equine Land Conservation Achievement Award. Nominations for the award, which recognizes an individual or organization for outstanding achievement in protecting land or access to land for equine use. USDF's Regional Group Membership Organizations (GMO) will nominate those individuals, organizations or agencies that they feel have exhibited exceptional land or facilities advocacy or protection related to the dressage community with local or nationwide impact. USDF executive Director, Stephan Hienzsch, says that the organization is 'very pleased to partner with ELCR on this award to help increase awareness of the importance of land conservation in the dressage community and to serve as inspiration to others within our discipline." The award will be presented at the Adequan/USDF Annual Convention awards ceremony on Saturday, December 2, 2017 in Lexington, KY. Convention and awards ceremony information may be found here . 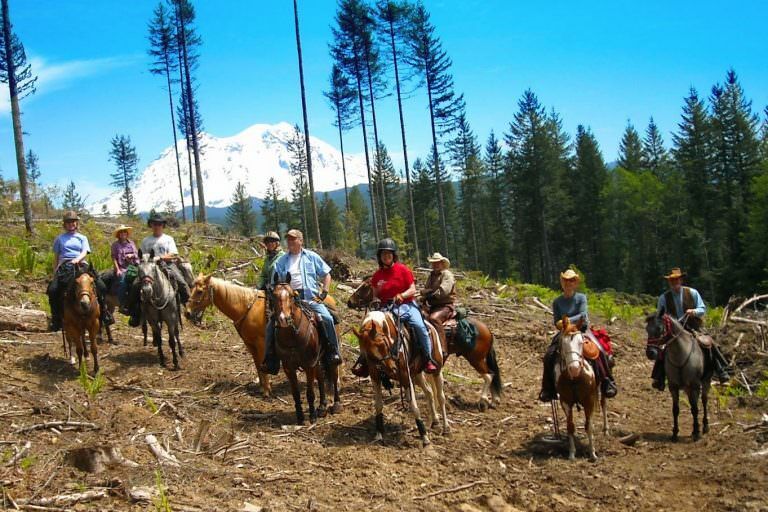 Back Country Horsemen of America takes very seriously their mission to ensure that public lands remain open to recreational stock use, and they know that their hard work also allows other user groups to enjoy more recreation opportunities. But sometimes BCHA’s on-the-ground trail work makes a difference in other, unexpected ways. From July 28 through 31, 2015, eight members of the San Joaquin-Sierra Back Country Horsemen of California joined four US Forest Service workers clearing a two mile long trail that connects the Rancheria Trail to Spanish Lake in the John Muir Wilderness of the Sierra National Forest. The trail was so overgrown and neglected that they sometimes had difficulty finding the original path. After several long days of hard labor, the team had removed 64 downed trees and cleared over 1000 feet of trail, making it passable once again for all trail users, including equestrians. On July 31, the day they finished their work and packed out to head home, lightning struck about five miles north of Hume Lake, not far from where they had been working. It started the largest wildfire California saw that year. The Rough Fire burned unchecked until it destroyed 151,623 acres and was finally contained on November 5. When wildfires burn in wilderness areas, firefighters try to honor the rules in place to protect those lands by using Minimum Impact Suppression Tactics (MIST). This includes using pack stock instead of mechanized transport to deliver supplies to firefighting crews. The USFS called on their packers to relay supplies to four different groups that were fighting the fire. Because the trail to Spanish Lake was clear, it was used as a fire line for the back burn. Firefighters set backfires to burn up the available fuel and stop the progression of the wildfire, which was heading toward drought-stricken timbered areas that would have allowed the fire to gain strength and speed. The accessible trail gave firefighters an open area to set backfires as well as providing an easy route for pack horses and mules to deliver supplies to various teams along the fire line. Once the back burn started moving away from the trail and towards the main fire, the recently opened corridor was invaluable in allowing firefighters to make daily patrols to ensure no burning material came down across the trail which could have started a new fire on the other side of the fire line. The crews remained vigilant until they knew the flames were fully suppressed. The Rough Fire burned almost twice as many acres as the second largest wildfire in California that year, and required 3,742 firefighters with 345 engines, 19 helicopters, and 45 bulldozers to contain. It threatened life and property, necessitating evacuation of Hume Lake Christian Camps, Dunlap, and the Wilsonia and General Grant Grove areas. The fire approached (but didn’t reach) the heavily populated areas of Fresno and Clovis. It resulted in ten injuries, one of them a firefighter who suffered severe burns and was airlifted to a medical facility, and hospital emergency rooms filled with folks with respiratory distress due to smoke inhalation. The fire line along the newly re-opened trail proved to be a major factor in containing this massive wildfire. The Back Country Horsemen of the San Joaquin-Sierra Chapter were just doing what they do: keeping trails open for all users to enjoy. They didn’t know that accomplishing this humble task would make it possible to keep a fire-breathing dragon from becoming an even bigger monster and swallowing up more of the state’s stunning landscape and maybe even claiming human lives and homes. In response to Trump, the West’s most liberal state goes on the offensive. The morning after the 2016 presidential election, California’s legislative leaders issued a message that has set the tone for the state under the new administration, under President Donald Trump. “Today, we woke up feeling like strangers in a foreign land,” it said. Since then, many Californians have pushed back against conservative policies on everything from immigrant rights to the environment. One of those offensives is Senate Bill 50, which, after sailing through committee this spring and summer, aims to stop the federal government from transferring or selling off public lands to corporations. The Public Lands Protection Act is part of a series of three bills introduced in late February called the “Preserve California” package, meant to preempt any efforts by the Trump administration to weaken environmental laws. The bill would allow California’s State Lands Commission first dibs on lands the federal government wants to sell, and would let the state have a say in transferring to a new owner. JAMESTOWN — The final phase in upgrading the Chautauqua County Equestrian Trail system is all a matter of time and partially dependent on future funds, said Senior Planner Patrick Gooch of the Chautauqua County Planning Department. This award, named after trails volunteer Ann Parr, was first given in 2012, and honors the member who has worked tirelessly for equine trails. Ann supported the Trails and Land Management Committee with her time, effort and knowledge. She worked with state count and city political offices from her home in Draper, Utah, to promote trail easement preservation and urban trails development. Ann led a campaign to enable the city of Draper to purchase an area previously slated for residential development for use as a public outdoor recreation area. Her trail advocacy and committee work are an inspiration for those who care for and work to preserve and expand equestrian trails across the country. Sharon Ballard proposed this award on the death of her beloved friend in 2011. This award may not be given every year. As you heard in our last call to action, the Administration's proposed budget for fiscal year 2018 reveals what are nothing less than catastrophic cuts to programs that directly impact trails and the places where Americans ride, bike, hike, and enjoy the outdoors. The proposed budget for trails and the federal agencies that manage and maintain trails on federal lands fails to provide for even the most basic necessities needed to maintain and manage these critical recreation resources. The President's budget cuts the Land and Water Conservation Fund (LWCF) by 84% compared to the amount approved by Congress for 2017. Similarly, the President's budget would cut the trails program of the U.S. Forest Service by 84%. There is little doubt the agency would be forced to make sweeping personnel changes that would leave few staff among local ranger districts to work with volunteers and partners-to say nothing about the complete lack of seasonal trail crews that could be expected next year. Such budget cuts would be disastrous and unprecedented. The good news is that Congress does not have to follow the President's proposed budget for 2018. But members of Congress need to hear from you. Otherwise, they just might fall in line behind the President's budget proposal. Please call your member of Congress today. 1. Let them know that trails and outdoor recreation are important to you. 2. Ask them to maintain the Land and Water Conservation Fund in 2018, at the minimum, at a level consistent with what Congress approved in 2017. 3. Ask that they support levels of funding that keep agency trail programs intact, as volunteers alone cannot be expected to do it all. 4. Ask that funding for trails reflect the growing importance of trails to the American public, including the outdoor "recreation economy," which directly supports 7.6 million jobs across the U.S.
To find information, including a phone number, for your representative in Congress click on this link. For contact information for your U.S. senators, click here. And if your congressman or senator is on one of the committees that control the agency budgets (i.e. the Senate or House Appropriations Committees, or the Interior Subcommittees) then your immediate action is especially helpful! Please consider reaching out to them immediately to let them know that you care about trails and trails infrastructure. If you desire more background and information on this issue, 3-page paper and a sign-on letter was carefully crafted in partnership with the American Hiking Society, Backcountry Horsemen of America, and the Partnership for the National Trails System, reflecting the level of concern among all trail user groups. Please take action TODAY to preserve access to trails on public lands. Our future access to public lands depends on it. Thank you for your efforts to ensure trails for everyone's future. On June 21st, Equestrian Land Conservation Resource launched our nationwide survey of locally-based organizations that are working on equine advocacy and land related issues. This ground breaking comprehensive survey will reveal important information about survey respondents, including their mission, existing partnerships, historical activities, model organizations, best practices, successes and failures as well as common issues and challenges shared among respondents. ELCR needs to continually renew our perspective on the equine community's land protection needs. Through the survey, respondents will be talking about their equine advocacy activities, giving us greater insight into where we should focus or re-direct our assistance and advocacy efforts. The survey is in partnership with the University of Kentucky's Community and Economic Development Initiative of Kentucky (CEDIK) as part of ELCR's ambitious three-year strategic plan (which can be viewed in full here). ELCR will utilize the results of the survey to inform and fine-tune our educational programming, resources and technical assistance services in order to better support local advocacy and conservation efforts. ELCR Executive Director, Holley Groshek, says "We know there are many outstanding local efforts across the country as organizations deal with equine advocacy and land protection issues. Success stories and best practices will be shared within our national network. ELCR will develop a better understanding of how we can best use our resources to support local equine advocacy and land conservation efforts." If your organization would like to participate in the survey, please contact Abby Gates at agates@elcr.org. The National Scenic and Historic Trails administered and managed by the U.S Forest Service are funded from the agency’s Trails Account (CMTL). For FY 2017 Congress appropriated $77.383 million for that account. The proposed Trump Budget for FY 2018 provides just $12.7 million for the Forest Service to maintain over 155,000 miles of trails—a reduction of 84%! If the Forest Service allocates a proportionate amount of funds for the National Trails at this funding level only $1.268 million will be available for them. Here’s a wellness aspect you may not have considered – the condition of your horse trails. A poorly designed or maintained trail can lead to that most dread situation, denial of equine access. To remain available to horseback riders, trails need respectful treatment. From design to maintenance, from concept to long term preservation, careful thought and actions are paramount for equestrians to sustain trail access. The relationships that you have with landowners and managers need to be nurtured and maintained too. Lack of respect for these relationships will likely lead to angry people and closed trails. 1. Whether public or private, trail landowners and managers have a stake in the value and condition of their land. Trail abuse by equestrians makes them very unhappy. 3. Horses are tough on land. The torque of pointy feet leads to churning of soil and plants, creating conditions for erosion. 4. Stormwater runoff makes trail erosion possible. Once erosion starts it needs to be corrected quickly. Clay soils are especially prone to erosion. ANZA – Following an Anza Valley Municipal Advisory Council Meeting in August 2014, a group of residents from Anza and Aguanga joined together to form a committee with the purpose of finding ways to establish community trails in the Anza and Aguanga Area. This group of like-minded people is working with the long-term vision of finding a way to design, create, construct and promote a more comprehensive and sustainable trail system that will enhance our area for residents and visitors alike. The all-volunteer committee has met six times a year since its formation in 2014 and has worked diligently. The work has not been easy and the committee has become well educated on the many nuances and obstacles for its vision to become feasible To date the committee has begun to map trails in the local area, attended meetings with Riverside County staff and other government officials on solutions to make community trails a reality, and the committee has attended meetings with local stakeholders and community members. The volunteers determined their course of action for the community to take and make the vision a reality was to become a 501(c)(3) nonprofit corporation. So as of March 2017, the Anza Area Trail Town (AATT) incorporated and begins its job of making a comprehensive community trail system a reality in our area. The Great Shasta Rail Trail follows the route of the eastern expansion of the McCloud River Railroad, stretching across 80 miles of the natural and human history of the west. The town of McCloud, at the western end of the trail, sits on the southern flank of Mount Shasta, an isolated volcanic peak rising 14,162 feet above sea level. Along the route, there are dense stands of timber, which drew loggers and early settlers. As the logging industry drew the railway east and south, camps, villages, and towns sprang up along the route until the railroad reached the vast timber resources surrounding Burney, the southern terminus. Though the railroad is gone, the towns remain. The story of the railroad still connects these communities, and will come alive again through the Great Shasta Rail Trail. In 2005, McCloud Railway Company (MCR) petitioned the Surface Transportation Board (STB) to abandon their 80-mile rail line between Burney and McCloud, California. In March, 2009, individuals interested in converting the entire 80-mile rail line (over 1,000 acres) into a trail formed a trail coalition. There was broad based community support for development of the proposed trail from local businesses and organizations, State and Federal agencies, land trusts, and individuals. A Core Team of non-profit organizations was composed of the Shasta Land Trust, Volcanic Legacy Community Partnership, McCloud Local First Network, and Ventura Hillsides Conservancy. The Core Team completed a draft “Trail Feasibility Study,” which describes the social and economic values of converting the corridor to public trail purposes. The Great Shasta Rail Trail Association (GSRTA) will lead detailed planning efforts, trail development, maintenance work, interpretative, and stewardship efforts. On November 23, 2009, SBF petitioned the STB for issuance of a “Notice of Interim Trail Use” (NITU). On December 3, 2009, MCR agreed to negotiate a “rail banking” Purchase Agreement for their 80-miles of rail line. On December 28, 2009, STB accepted and granted SBF’s request of NITU. The completed recreational trail will provide numerous benefits to the rural communities of Burney and McCloud, as well as to adjacent property owners. Many studies have shown that recreational trails stimulate tourism and recreation-related spending, increase property values, and attract new businesses, which all benefit local economies. Greater opportunities for outdoor exercise and recreation will improve the quality of life and health benefits for Shasta and Siskiyou County residents and tourists. GSRT will provide an invaluable link between Burney, McCloud, and McArthur-Burney Falls Memorial State Park. It will also connect with the Pacific Crest National Scenic Trail and recreation facilities on adjacent national forest land. GSRT is envisioned as a shared-use trail, providing opportunities for hiking, biking, equestrian use, cross-country skiing, and possibly motorized trail uses such as winter snowmobiling. In addition to increased opportunities for recreation and tourism, GSRT will also protect important natural resources and scenic amenities in northern California. The corridor offers almost innumerable possibilities for scenic overlooks and access to several streams, rivers, falls, and lakes for camping, picnicking, and fishing. It will provide access to hunting areas as well as opportunities for wildlife viewing and plant study. The trail will serve as a long-term fire break and critical access for emergency fire suppression. It will protect several historical sites and provide a new venue for community events to stimulate local economies through tourism and fund raisers. In February 2013, a workshop brought together members of the San Francisco and Sacramento Chapters of the American Society of Landscape Architects, and Great Shasta Rail Trail volunteers to create design concepts for the trail. The workshop involved an overview of the proposed trail, outlining regional and cultural history, user needs, and goals for the project, with special focus on the locations of identified trailheads and the region’s natural resources and topography. The trail will echo the route of the rail line and, although the rails have been removed, its sinuous journey through the Sierra–Cascade landscape remains. Most of the trail surface will be compacted volcanic cinder and at least eight feet wide, but near access points and communities, it is envisioned that the trail will be a hard surface to provide for accessibility. Where feasible within the corridor, an equestrian trail will parallel the pedestrian–bike trail, either on the trail shoulder or as a separate trail. Motorized use will be limited to areas where existing uses cross the trail corridor. The Administration's proposed budget for fiscal year 2018 reveals what are nothing less than catastrophic cuts to programs that directly impact trails and the places where Americans hike and enjoy the outdoors. The proposed budget for trails and the federal agencies that manage and maintain trails on federal lands fails to provide for even the most basic necessities needed to maintain and manage these critical recreation resources. A sign-on letter was carefully crafted in partnership with the American Hiking Society, Backcountry Horsemen of America, and the Partnership for the National Trails System, reflecting the level of concern among all trail user groups. If your organization is as shocked at the Administration's proposed budget as most of us who support trails, outdoor recreation, and public lands, we ask that you add your organization's name to the sign-on letter which will be provided to the appropriators and other members of Congress. If you are a partner organization, please sign on to this letter. If not, please share this with your favorite organizations including those who are not trails-specific but that advocate for things such as public health, business, and outdoor recreation.